Now the good news is that I loved pretty much every bite of this one. The bad news is that it took me forever to find a parking space which meant I walked right in to the middle of a lunch rush, but you know what? It was still totally worth it. So the lady asks me what I would like and I say mom's making cookies. She tells me I've made a great choice but asks if I want a sample first since it is very sweet. I say it's ok since I'm pretty sure I'm going to like this one. As she's scooping it up, another employee comes over and goes "oh, I love that one! I've had it three times already". The bowl isn't even in my hand yet and I've already got two glowing recommendations for it. Yeah, I'm stoked. I sit down, take a few pictures, and dig in. On the first bite, and maybe the second, I can't help but wonder if it is a little too sweet... but then I decide nope, I love it, and I am going to plow through it like there's no tomorrow. Quality is not an issue here, and the flavor, oh, there is so much flavor. The swirl does an awesome job of flavoring every bite. If you've had the swirl in Blue Bunny cookie dough ice cream then you kind of know what this swirl tastes like, just stronger and more plentiful. It's sweet, flavorful, and it just really hit the spot on a sunny day. look again when the lighting is a little different, the cookies are everywhere! Now texture is were this one seals it's fate as one of as an excellent BR flavor. To be honest, I didn't really notice the chocolate chips, but what has happened is that the cookie pieces have broken apart and added this great textural component to compliment the strong flavor. You guys know I love when texture plays a big part like this and it just makes for such a fun experience. I loved it, I really did. The funny thing was that there were a few cookies that were still fairly whole, but I couldnt really taste them over the base. They are fairly soft (which led to them breaking up so well), but actual flavor? Yeah, I was too busy inhaling my treat to say anything more than their flavor is muted. Ok, positive ranting over. If you have access to this one, I would try this one. If you love Blue Bunny's version, they you really must try this version. And if the sweet nature of this one scares you a little, just ask for a sample, they don't mind. I actually thought it just tasted like brown sugar. The cookie dough element got lost. I'll stick to their regular cookie dough ice cream. so mad i don't have a baskin robbins. so mad. As usual another great review! Your thoughts and efforts are always appreciated! @Jessica: The sweetness is dominating, but that's why I mentioned blue bunny, since I am kind of use to that approach. At some point I will have to try the regular cookie dough for comparison! I loved this! I think the brown sugar base is perfect for the cookie pieces and cookie dough swirl. I prefer it to the typical vanilla base. 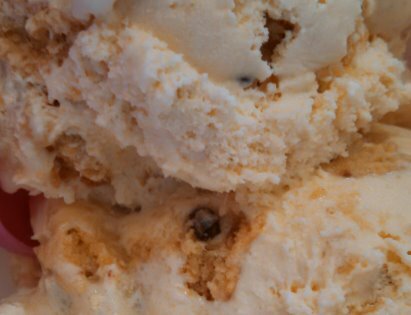 It is sweet - I think that should be expected when eating ice cream with cookies and cookie dough - but I did not find it sickly sweet. Has anyone tried the churro and golden Oreo flavor? I loved this last year, and was so excited to see its return, that I bought a quart of it on May 1. Don't judge me. @Anonymous 3:17: I loved the Golden Oreo Churro flavor, but I only got a sample. Was waiting until my quart of Mom's Making Cookies ran out before I went back for a scoop. Did you like it? @Nick: yeah.... but I forgot! so embarrassing! It was yummy. 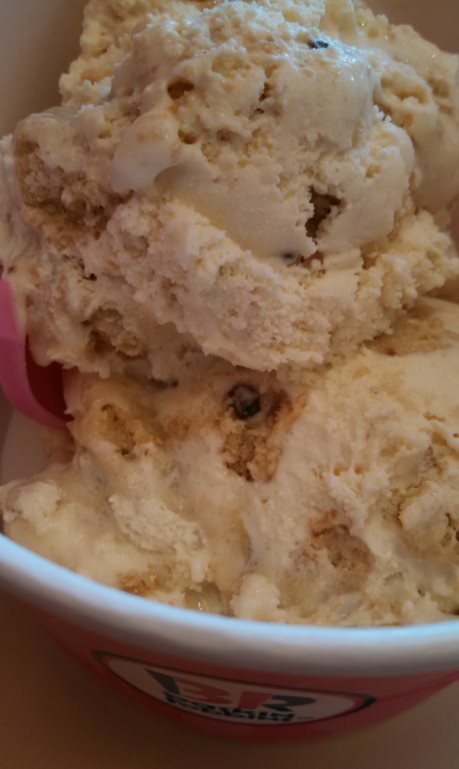 It tasted look Chewy Chips Ahoy cookie was mixed into vanilla ice cream. I got a sample of this flavor. I got a banana taste. This caused my family to taste as well. Same banana taste. Store owner was next. He found the banana also. Very odd. SOOOOOOOOOOOOO AMAZINGLY DELICIOUS!!!!! I got a pint of it at our local grocery store, and I sat down to eat thinking "I'll just take a bite/taste/have a lick." Nope, I devoured the whole thing! It was incredible. Thanks for your reviews, they are so helpful.